I have been a member since 2008 (and am still visiting 4 rest homes); the Manawatu & Rural areas Liaison Officer (since 2011); the North Island Field Officer (in 2014) until I became the President in 2017. I do my utmost to promote Canine Friends wherever I go as I strongly believe in the benefits that pet therapy provides to people in need. My involvement with Canine Friends Pet Therapy began in the early 1990’s as a volunteer and committee member. With much pride I have witnessed the growth of our organisation from small beginnings in Wellington to a recognised and respected nationwide charity. In 2015 I was privileged to be recognised as an honorary member. 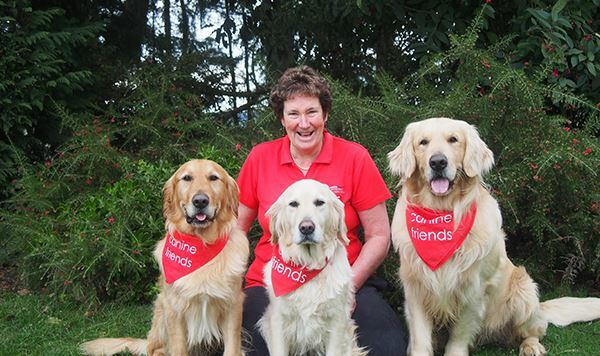 I established Canine Friends in Taupo in 2008 and am currently acting liaison officer for Waikato. Since 2017 I have filled the roles of vice president and funding/sponsorship coordinator. I wholeheartedly believe in our work and helping those who can no longer enjoy the benefits of owning a dog – this was our beginning and to me is the essence of our charity.